Having dinner at Restaurant Le Graffiti in Québec, Canada where Executive Chef Robert Saulnier focuses on an Italian menu, followed by a night at the nearby Opéra de Québec, made for a perfect evening of pairing gastronomy and culture. It was a Tuesday night, it was still early to provide us with enough time to be able to enjoy a relaxing dinner before attending the performance of Cavalleria rusticana and I Pagliacci at the Opéra de Québec, and the Restaurant Le Graffiti was already bustling. 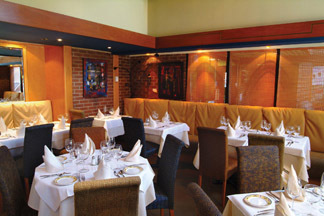 Restaurant Le Graffiti has long been a favorite of local Québécois since it opened 25 years ago, winning awards throughout the years for their wine cellar, as well as for Executive Chef Robert Saulnier's cuisine, where the highlights of the Italian menu include housemade pasta, seafood, and meat dishes. We sat on a banquette at a table by the window that was dressed with white linens and a votive candle, where we had a view of the restaurant with its bold paintings gracing the brick walls, the wood beamed ceiling, and the attentive servers moving about. Low background music provided the perfect accompaniment as we watched the passersby out for an evening stroll along avenue Cartier. Edward F. Nesta and I had dinner at Restaurant Le Graffiti in May 2009, and began our evening with aperitifs of Prosecco as we perused the extensive menu. 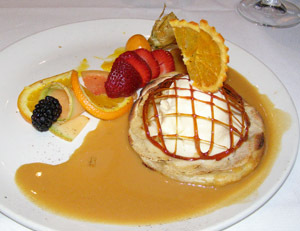 After careful consideration, Edward selected one of the restaurant's signature dishes, Calf Sweetbreads in Filo Pastry with Endive Salad and Caramelized Apples for his first course. 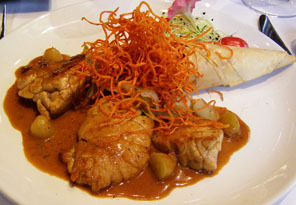 The presentation was lovely, three perfectly golden sweetbreads bathed in a complementing pool of sauce with large diced caramelized apples, and a filo pastry cone filled with endive and garnished with deep-fried long julienne carrots, sprouts, an edible flower, and a cherry tomato. 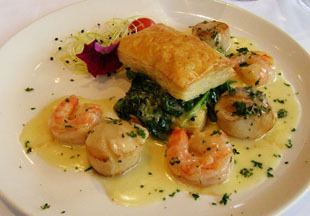 I had Shrimp and Scallops in Flaky Pastry with Spinach, which was also well presented, and consisted of alternating large shrimp and large scallops surrounding a rectangular puff pastry base topped with sautéed spinach and finished with a golden pastry crown, with a rich sauce, and garnished with chopped herbs, sprouts, an edible flower, and a cherry tomato. 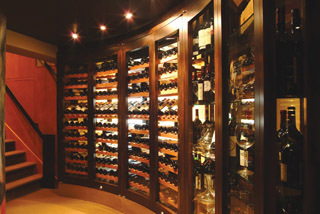 For his main course, Edward had Veal Scaloppini with lemon sauce, angel hair pasta, and fresh vegetables, that were well matched with a 2005 Castell d'Age, Tempranillo, 12% alcohol, from Pendés, Spain. 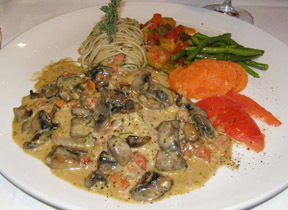 This course was beautifully presented with the veal bathed in a rich mushroom sauce, with perfectly coiled angel hair garnished with a sprig of rosemary, accompanied by ratatouille, haricots vert, sliced carrots, and sliced tomatoes. 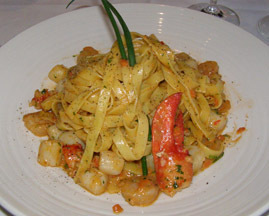 I continued with the Tagliatelle Pasta with Lobster, Shrimp, Scallops, and Vegetables that was paired with a 2007 Anthilìlia, Donna Fugata Planeta, IGT, 13% alcohol, Sicily, Italy, with peach and yellow plums on the nose and the palate. To say that the portions at Restaurant Le Graffiti are ample would be an understatement, and when my pasta arrived, I knew why they list two sizes on the menu, appetizer and main. However, with that said, and the fact that I did not read this until much later, and did not order the appetizer portion, I diligently worked my way through the mountain of pasta delectably laden with seafood and garnished with chives, savoring each bite of tender pasta, succulently sweet lobster, shrimp, and scallops. Somehow, despite the ample dinner portions, we did manage to indulge in dessert, a lovely rustic apple tarte attractively presented with a round pastry base topped with thinly sliced apples under a mound of vanilla gelato and dressed with a spun sugar crown, a Cape gooseberry (physalis), sliced strawberries, and a slice of orange. Paired with a 2007 Muscat de Limnos, 15% alcohol, made with 100% Muscat de Alexandria, from Greece, it was the perfect finale to a great dinner. As they say in the world of opera, Bravo! Read about the Restaurant Le Graffiti in the Chefs' Recipes section where Executive Chef Robert Saulnier provides his delicious recipe for Shrimp and Scallops Fricassée perfumed with Star Anise in English and in French.